A first-light paddle out is a gratifying—and cold—holiday tradition. Warm her afterward with the Girls’ Better Sweater® 1/4-Zip. 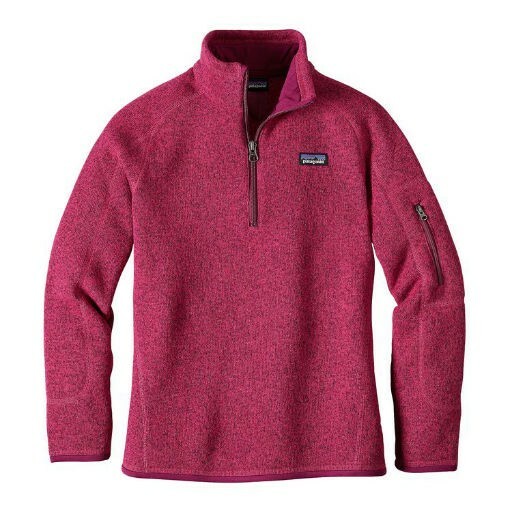 This cozy pullover is built from 10-oz polyester with a sweater-knit exterior and a fleece interior. The fleece is dyed using a low-impact process that significantly reduces the use of dyestuffs, energy and water compared to conventional dyeing methods. For comfort, the zip-through stand-up collar has a welted zipper; the shoulder seams are set forward for ease under pack straps, and the soft, brushed polyester jersey trim inside neck, zipper garage, cuffs and hem is supercomfy. Treasures can be stashed in the zippered security pocket on the sleeve. Princess seaming for a contoured fit. Fair Trade Certified™ sewing. Hand-me-down ID label.